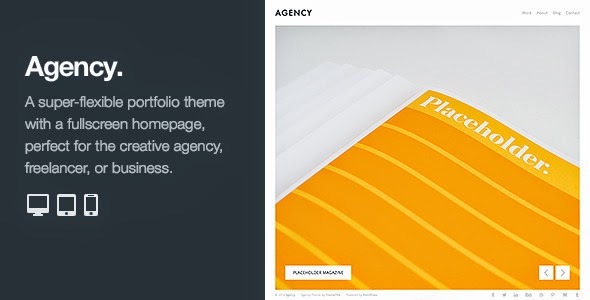 Agency was designed with creative agencies and freelancers in mind. The full screen homepage, two portfolio layouts, and strong typography offers a blend of flexibility and minimalism in this feature-set theme. Beautifully Minimal – A clean and gimmick-free design that focuses the user’s attention on your work. Uninterrupted, the way a portfolio should be. Two Portfolio Layouts – Choose how you want to show your work, using either a list-view or grid-view portfolio page. You can also categorize your portfolio items for more organization. Fully Responsive Design – Serve an optimized version of the volumes theme to your visitors using tablet and mobile devices. Optimized for iPad and iPhone. Give the demo a whirl. Accent Color Control – Control the accent color of your site without touching a single line of code. Truly effortless setup and customization. Post formats – This theme supports post formats, meaning your blog can feature dedicated image, gallery, and self-hosted video and audio posts, as well as quotes and links, and of course standard articles. Item Reviewed: Agency Fullscreen Minimal WordPress Portfolio Template 9 out of 10 based on 10 ratings. 9 user reviews.